Emily Press Labels has created stylish, original label designs to appeal to all ages so there’s a unique design to suit everyone. Not only do they look good, they are produced to be super tough and durable through the use of commercial printers and top quality materials. Save the expense of repurchasing items again and again by using our labels to help stay organized and keep belongings returning home again. Our Classic, Slim and XLarge sticky labels are waterproof and have an extra strong adhesive. A glossy topcoat is added for extra protection. Classic size sticky labels are a great all-purpose size label for books, mugs, water bottles, cell phones, bike helmets, binders, lunch containers and sports gear. 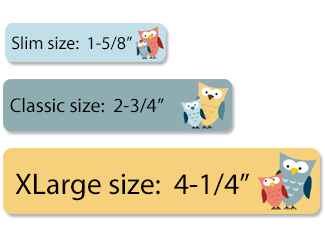 Slim size sticky labels are thinner and work well for labeling toothbrushes, sippy cups, baby bottles, medications, staplers, rulers and other school supplies. XLarge size sticky labels work best for bigger items like coolers, tents, camp trunks, luggage, backpacks, laptops, garbage bins and sports equipment. We also offer Pencil name labels! Super slim, they are all about function and are suited for any pencils, pens, crayons and markers you need to label for school or office. And for books - our book labels identify story books and school books as well as electronics, movies and other stuff leaving home. They're water resistant and stick tough however these labels are not intended to be used in the dishwasher or microwave. Our Clothing labels include Shoe labels and peel & stick Tag-a-Tag™ labels. They have the same glossy topcoat as our Sticky labels for extra protection. As well, the topcoat protects the label's bright colors for laundry safe washing. We also have colourful Iron-on labels in coordinating designs. Shoe labels have a rounded end to follow the curve on the inside soles of shoes, boots, sandals and other footwear. They stick on the outside of rain boots too! 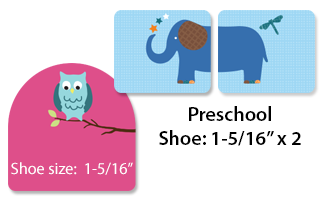 Our Preschool shoe labels teach little ones left from right by having them match tow labels to create one cute image. Our Shoe labels have a topcoat already built in so messing around with extra stickers on top. Our Tag-a-Tag™ clothing labels are specifically made to peel & stick onto the brand or care tag of clothing usually found on a neckline or inside seam. (Not directly on fabric) No more sewing and no more ironing. 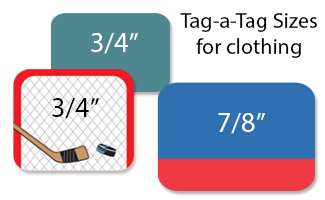 The Tag-a-Tag™ labels are extremely tough so they will stay on through the laundry cycles wash after wash. When the Tag-a-Tags need to be removed, most will peel off cleanly from the care/brand tag. Iron-on clothing labels are ironed on directly to the clothing fabric. From the heat of the iron, the iron-on labels are infused into the clothing and it creates a permanent bond. Our iron-on labels are super soft so they won't irritate like some iron-on labels and they are printed with our colorful, modern designs - much more fun than a plain white label. 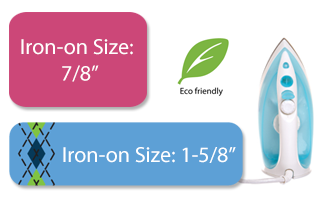 Our Iron-on labels stay stuck through the laundry cycles wash after wash. BPA-free and ecofriendly labels too! Our eco-friendly Reusable labels have a unique adhesive that makes them restickable and removable leaving no sticky residue when applied to most smooth surfaces like metal, plastic or glass. They can be reused over and over again making them very cost-effective. Reusable labels are water resistant, phthalate-free and lead-free with a textured surface that can be wiped with a damp cloth. Our eco-friendly Reusable labels are great to stick to camp gear then peel and reapply them to lunch boxes, inside reusable snack bags and all the school supplies at back to school season. You can label everything on the school supply lists especially those items like pens, rulers and binders that don't require a dishwasher-safe label. And for school supplies that need replacing such as glue sticks, markers and pens, remove the Reusable labels and reapply on the new school supplies.